Scientists fear the disease could push some species to extinction and dramatically reduce the population of an animal that farmers depend on for natural pest control. The survey found that statewide losses of little browns, the most common bat species in New York before white-nose, remain at about 90 percent. New York state bat biologist Carl Herzog said that while counts were up in the three caves west of Albany for little browns, bat-counters could have missed some in previous surveys and new bats coming to hibernate in the caves are a contributing factor. But the possibility that bat populations could adapt to the fungus has long been the hope of scientists. “That's what the perfect scenario would be - that the area that was first hit would be the first to recover because they would have had more time to adapt to the pathogen,” said Beth Buckles, an anatomic pathologist at the College of Veterinary Medicine at Cornell University. Buckle, who is not involved in this project, said while she's hopeful, she needs to see more data over more years. In an effort to track the long-term effect of white-nose, Herzog and a team of researchers caught bats outside one early-hit hibernation cave on a recent moonlit night. Bats that flew out for an insect snack hit filament lines and fell into a bag where they were snatched up to be swabbed and examined. As bats chirped in protest, their wings were stretched flat on an ultraviolet light table about twice the size of a smartphone screen. When the purple light shined through the translucent wing, infected spots that can't be seen with the naked eye became fluorescent orange. 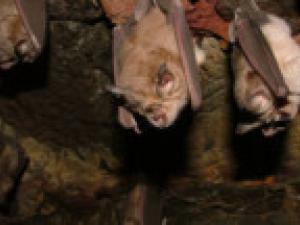 The infection patterns were photographed and will be compared with those of bats that succumbed to the disease years ago and with newly infected bats in Pennsylvania. They will also be compared with bats in the Czech Republic. Scientists recently confirmed that white-nose fungus hitchhiked from Europe, possibly on the boots or clothes of a well-travelled caver. Based on observations so far, Herzog said bats from the long-exposed cave are dealing with the disease better. But he said despite some good news from early-hit caves, there are still more questions than answers.